There are very few machines for which each and every team member shows excitement and whose keys become a hot topic among all. 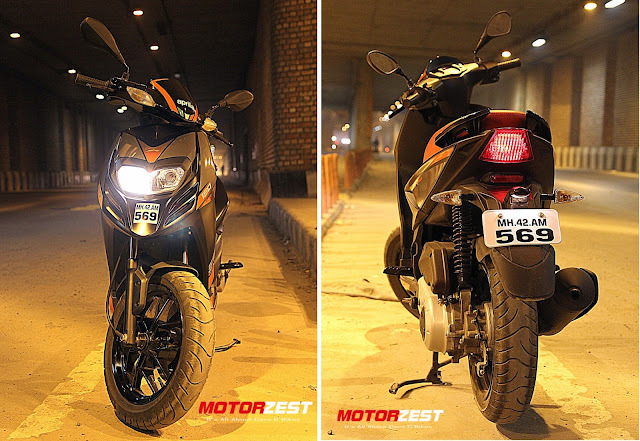 We got just that machine to review this time, say hello to Aprilia SR 150! Everyone had different reasons to test this Italian scooter. When you look at the SR150 you will realize that there is something different about it, it doesn't look like a day-to-day scooter. And then you notice the Aprilia vinyl sticker over it which gives you a feeling that this is not meant to be a normal scooter. 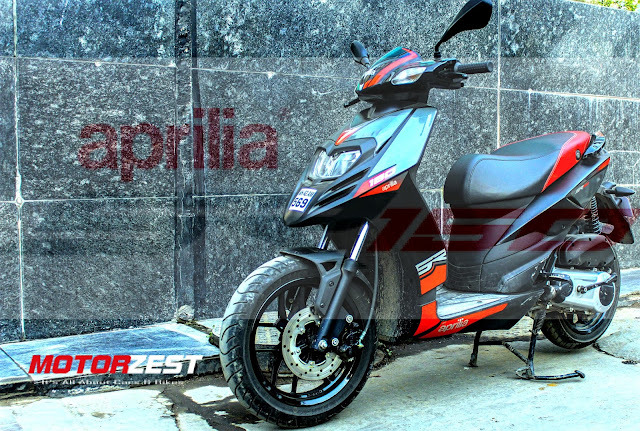 Even if majority people do not have any clue about the Aprilia name, on the road it quickly grabs everyone's eyeballs towards it. Right from the twin headlights, beaky front fairing, red stitched seats to large 14-inch 5-spoke wheels, everything screams attention and give others an idea that it embodies a charismatic Italian design philosophy. The only thing which is ordinary is the instrument cluster with analog speedometer, odometer and fuel gauge. The build quality is impressive with the gleaming paint and even panel gaps but just like cluster, the switchgear feel isn't on the premium side. It has an additional pass light switch embedded into low beam switch which comes in very handy at night. The attention to detail is also something special as the brake fluid reservoir and rear foot-pegs are neatly tucked inside the respective panels. The SR150 is powered by a 154.4cc, air-cooled, carbureted single-cylinder engine that develops 10.4 bhp of power and 11.5 Nm of torque. This engine is shared with the Vespa 150, but Piaggio says gearing has been changed to suit the role of this scooter and when you ride the Vespa their claim seems absolutely valid. It is easily the most powerful gearless scooter available as it lunges forward like a 150cc bike going flat out. In fact, during the testing, some naive 150cc bike riders found it hard to cope up with this Aprilia. As for the numbers, 0-60 kmph comes up in 6.8 seconds and it easily crosses 100 km/h mark touching 120 km/h on the speedo. There are some annoying vibes at idle but they vanish once it picks up speed. Even at 100, the engine doesn't feel strained so cruising on the highway is a piece of cake for SR150. The exhaust note is also throaty and adds to the fun of twisting the throttle hard. The SR uses a tubular underbone chassis combined with 14-inch wheels wrapped in Thai made fat 120 section Vee Rubber tyres and has 32-inch telescopic forks up front. This combo provides SR exceptional poise around corners and during lane changes at high speeds. The SR doesn't fall into corners like most scooters but dips predictably and feels planted throughout showing that the tyres holds up pretty well. At slow speeds, this suspension setup feels firm and undulations filter through. 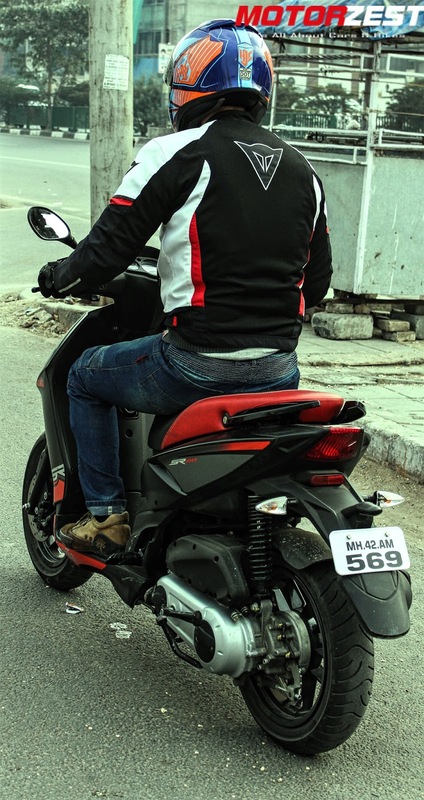 But when the speed increases, the SR150 feels very planted and doesn't crash into potholes. The task of slowing down this power-scoot is done by 220 mm Bybre front disc and 140 mm rear drum brakes. The initial feel and bite of the front disc can shame some high capacity bikes as SR150 comes to a full halt in no time. Although bite at the rear is a bit soft; to avoid lockups. The real concern is that one should be careful while using only the front disc on patchy roads as the firm front end becomes jittery which makes front tyre loose traction while braking hard. Just for fun? Or practical as well? As you already read till now, the Aprilia SR150 is tilted towards sporty riding dynamics and not commuter-ish tasks, it should come with some compromises. 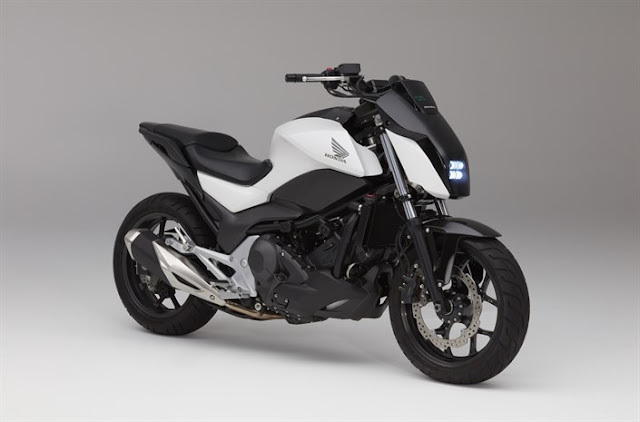 So, not only the SR150 doesn't come with any bells and whistles of digital instrument cluster, external fuel filler cap, USB charging (provision provided) but also basic things like a brake lock clasp and side stand which one has to buy as a compulsory accessory. Albeit, it comes with a useful bag hook and decent storage space under the seat. As stated above, the ride is firm so all members of family wont find it ideal for daily use and with all that power at disposal, it returns a low fuel efficiency of 38 kmpl increasing to 44 kmpl on highways . The seat itself is a bit high for short people and sloping, so everytime one brakes hard the person slides forward. The twin headlight setup is a big advantage as it illuminates the road at night better than any other gearless scooter in the market. As you know there is no such thing as perfect but from the performance point of view, the SR150 is the best performance scooter (in fact the only) you can buy in India (unless you plan to import some other machine). Again, for the price it comes - a mere INR 65,000 (ex-showroom Delhi) - for the most powerful scooter is truly remarkable. The SR150 is the cheapest way to add an Aprilia to your garage if you find their brutal superbikes out of reach. We had an amazing time with the SR150 and are pretty sure that you will too!